Gaston Leroux was born in Paris, the son of a wealthy storeowner. He attended school in Normandy and studied law in Paris, receiving his degree in 1889. After inheriting nearly one million francs, he spent most of his time drinking and gambling. Finding his money gone, Leroux started to work as a theater critic and reporter for L'Écho de Paris. By 1890 Leroux had become a full-time journalist. Between the years 1894 and 1906, he traveled in different countries in Europe, Africa, and Asia as a correspondent. 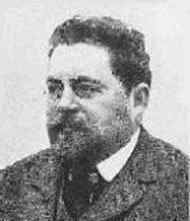 Leroux wrote for the daily newspaper Le Matin and L'echo de Paris and reported, amongst other things, about the Russian Revolution of 1905. From 1909 Leroux devoted himself entirely to writing, focusing on plays and popular novels of mystery and detection. In 1919 Leroux established his own film company called Cinéromans. Leroux died in Nice on April 15/16, 1927, as a result of an acute urinary infection. Although The Phantom of the Opera is a version of the classic tale 'Beauty and the Beast,' the fatal obsession is now music. "Erik was born in a small town not far from Rouen. He was the son of a master mason. He ran away at an early age from his father's house, where his ugliness was a subject of horror and terror to his parents." After years of wandering, Erik hides himself in the cellars and corridors of the Paris Opera House. He has helped in the reconstruction of the cellars and incorporated many trapdoors in the building. He falls in love with a young singer, Christiane Daaé, and arranges a series of deaths to advance her career. Raoul, Vicomte de Chagny, is also in love with Christine, but she is forbidden by Erik to respond to his advances. When the Opera managers refuse to make her a star, the unmasking of Erik's evil side leads to his destruction. "'Know,' he shouted, while his throat throbbed and panted like furnace, 'know that I am built up of death from head to foot and that this is a corpse that loves you and adores you and will never, never leave you!..." The plot is presented as a story pieced together from interviews, revealing the "true" history of the Opera Ghost. In the classic film version from 1925, Lon Chaney was the victim of torture with a crazed mind. Chaney is a composer and in his obsession with Mary Philbin, a lovely singer, he drives away the opera's star so that Philbin can have the lead in 'Faust.' Philbin is twice-abducted by the Phantom to his secret world. The great moment of the film is when the Phantom is unmasked while playing the organ. The film was banned in Britain for four years as a result of a misfired publicity stunt. In 1930 a talkie was issued, with some new footage and dialogue which had been recorded by the surviving actors. Arthur Lubin's remake in 1943 paid a great deal of attention to music - Nelson Eddy, Susanna Foster, and Jane Farrar had singing roles. The Phantom of the Paradise (1974) was Brian de Palma's horror comedy-drama about a disfigured musician haunting a contemporary pop palace. The film was poorly received by many critics but attained a large cult following. Susan Kay's novel Phantom (1990) was based on Leroux's work and won the Romantic Novel of the Year Award. Terry Prachett also played with Leroux's ideas in his Maskerade (1995). Leroux started to write novels in the early 1900s. Between the years 1903 and 1927 he produced two dozen newspaper serials, many shorter works, and seven plays. In both Great Britain and the USA Leroux's reputation was long based on his mysteries. His breakthrough work was Le Mystère de la chambre jaune (1907, The Mystery of the Yellow Room), which introduced the teenager crime reporter Joseph Josephson (aka Rouletabille) with a bullet-shaped head (hence his name). Its plot included one of the first 'locked room' murder motifs. Mademoiselle Stangerson is found in The Yellow Room, lying on the floor in the agonies of death. She has cried "Murder! - murder! - help!" The room is locked on the inside with a key and bolt, and the blinds on the only window are also fastened on the inside. Rouletabille's friend, Sinclair, chronicles the story, and serves as Rouletabille's own Dr. Watson. The official detective in the case, the least suspected person, is in fact a notorious criminal - later a much used bluff. Le Parfum de la Dame en Noir (1909), the sequel to Le Mystère... also gained popularity. Later the character of Rouletabille inspired several films. Henri Fescourt's 10-episode serial, Rouletabille chez les bohémes, was made in 1921, starring Gabriel de Gavrone. Istvan Szekely made Rouletabille aviateur (1932) with Roland Toutain, and Christian Chamborant made loose adaptations of Leroux's work, Rouletabille joue et gagne (1946) and Rouletabille contre la dame de pique (1947). In the 1960's the hero appeared in France in a television series. One episode was directed by Yves Boisset. Claude Brasseur played the detective under the direction of Jean Kerchbron. Leroux's other series character was Cheri-Bibi, who appeared in such detective novels as Cheri-Bibi (trans. 1914), Cheri-Bibi: Mystery Man (trans. 1916), Missing Men: The Return of Cheri-Bibi (trans. 1923), and The Dark Road; Further Adventures of Cheri-Bibi(trans. 1924). The first film of Chéri Bibi was made in 1913, directed by Gérard Bourgeois and starred René Navarre. Charles Krauss directed Les premieres aventures de Chéri Bibi (1914), starring Emile Keppens. Nouvelle Aurore / Nouvelles aventures des Chéri Bibi (1919) was directed by Edouard-Emile Violet, starring José Davert. Léon Mathot continued the adventures with Pierre Fresnay in Chéri Bibi (1937), and the Italian Marcello (Marcel) Pagliero made Chéri Bibi / Il forzato della Guiana (1955), starring Jean Richard. Leroux's narrative was fast moving, and he often used complicated plots. In his youth he wrote stories inspired by Alexandre Dumas and Victor Hugo. Later mature work shows the influence of Jules Verne and Edgar Allan Poe, especially 'The Masque of the Red Death' (1842) in The Phantom... and the tale 'Thou Art the Man,' in which the detective turns out to be the murderer. In the novella The Burgled Heart tr. 1925) Leroux employed supernatural elements - the astral body of a French woman is abducted by an English artist. The Kiss that Killed (tr. 1934) and The Machine to Kill (tr. 1935) featured a vampire and a robot as murderers. The detailing of a crime committed in a sealed room, its perpetrator vanished. Opera singer Christine, the ingénue of the Phantom, must choose between the Phantom and the Viscount, whom she loves.